Do you remember the first plant that started your interest in gardening? When I was growing up at home we really did not have any flowers around our yard. We may have had a few tulips here and there but that was about the extent of flower color in our landscape. Then when I met my husband, Rod, my whole outlook on flowers and gardens changed. He got into flowers at the young age of 8 when he started to work for a neighbor who had greenhouses. So needless to say the flowers came home to his parents house and they had flowers all the way around there yard. But the one flower that I noticed the most was the Hibiscus. They had them in the front yard by the garage, planted in old tire rings around the pool area, and out back in the gardens. I was just amazed at how large a flower that plant had on it. I had never in my life seen a flower so huge, and a plant so covered. Now that Rod and I have our own house we to have brought the Hibiscus into our landscapes. Hibiscus have come along way over the past 20 years, so many new varieties have been introduced and the variations are so numerous. 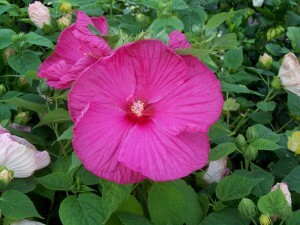 One characteristic that you can look for in Hibiscus are their height. The Luna™ series are a dwarf variety that stands only 3 foot tall. It is a nice tidy looking plant that stays nice and compact. Also there are so many flower colors and patterns, a few of my favorites for nice color and patterns are: Hibiscus ‘Jazzberry Jam’ has a nice deep pink rose color, Hibiscus ‘Peppermint Schnapps’ is a great pink and white tie dye look, and Luna™ White is a crisp clean white that has a beautiful red “eye”. If you properly care for your Hibiscus they will be an addition to your garden that you will be able to enjoy for years to come.